Our Choir Appreciation dinner took place at church on Sunday evening. At our table of 9 sat three Dorsey alumni, not including myself. I knew two of them had attended my alma mater from prior conversations but the third one was a surprise. I asked Eileen what her maiden name was so that of course I could immediately look her up in the yearbook when I got home. Her last name used to be Quon, and she graduated two years before me. Turns out I was in the same homeroom with her brother, Danny. 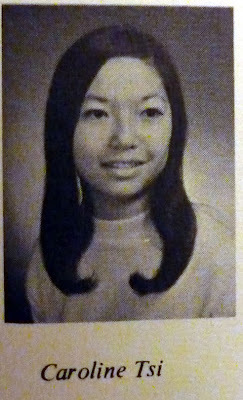 Eileen had also graduated from Foshay. Then she told me that Carol, our fellow choir member, was in her class. She was? I asked what Carol's maiden name was. "Did she used to call herself Caroline?" I asked. "Really? Did she use to work in the tutorial room at Foshay?" Eileen pointed at Carol who was sitting at the table next to us. "Why don't you ask her?" So I asked her. Yes, she used to help out in the tutorial room at noon. "You remember the mighty Mr. Power?" she asked me, raising her fist up in the air and laughing. "Oh boy, I owe you an apology!" I told her. "I used to torture you when you were in charge of the tutorial room. We'd keep going in there and goofing off and you would always chase us out but we kept coming back. You used to get so upset!" "You did? I don't remember any of that." "You probably blanked it out of your mind because it was such a traumatic experience," I laughed. "A couple of times you were even in tears. I've always felt bad about that, and after all that time, here you are!" I've mentioned Caroline (wasn't sure if it was Carolyn, or if her last name was Tse or Tsi but I sure do remember her) a couple of times in this blog, about how I've felt bad all these years for causing such havoc when she was in charge of the tutoring room at Foshay. The one image I have of her is standing at the doorway with tears of frustration in her eyes, courtesy of yours truly and my buddies. And now it turns out that, after all these years, we've been friends. Not only in choir, but in the same Bible study group. This Carol was the Caroline I've remembered and felt bad about all these years for getting her so upset back at Foshay! She and Eileen thought it was funny how I'd remember something like that after such a long time. I told them it's because I've always felt bad about it. So that evening I had a chance to apologize! We had a good laugh over that one. I came home and looked up Eileen's and Carol's picture in my Dorsey and Foshay yearbooks. 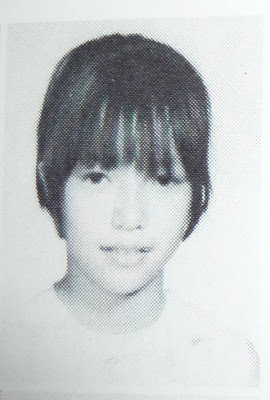 I didn't know Eileen back then and I would never have recognized her based on her yearbook pictures. But as I looked at Carol, I could see the resemblence to the pictures. Yup, that was the same one me and my buddies used to torture by refusing to stay away from the tutorial room!